It's seemed to me for a while that some of the traditional dividing lines between different types of speaker are becoming blurred. Of course, there have always been examples of speakers with feet in multiple camps, the Yamaha NS‑10 and the BBC‑designed LS3/5A being obvious examples. But in our increasingly multi-format, multi-channel, multi-platform audio world where, for example, a video game soundtrack that's largely choral was recorded at AIR Studios (Everybody's Gone To The Rapture), or live music is broadcast as an immersive audio stream (see Moods Jazz Club: www.moods.digital/en/), the traditional roles of speakers are changing. The nearfield/midfield monitoring speaker niche that I most often write about in these pages is a perfect example of a market sector where change is afoot, and the subject of this review, the Genelec S360, shows how one manufacturer is responding to the change. But how, you might reasonably ask, are things changing? Well, it's predominantly about channel count and scale. Traditional music mixing brings to mind a pair of small(ish) nearfield speakers located maybe a metre from the listener, a pair of midfield speakers perhaps two metres or more away, or a pair of soffit‑mounted main monitors either side of the control-room window. But those traditional paradigms can't really accommodate the increasing demand for multi-format and immersive multi-channel material. Genelec's expectations for the way in which the S360 is likely to be used illustrate perfectly why 'we're not in Kansas any more' when it comes to monitoring. They see the S360 not as a nearfield or even a midfield monitor, but as a speaker to be used flexibly in multi-channel monitoring, for TV, movies, games and VR applications, where perhaps 16 or more speakers, each potentially at a significant distance from the listening position, might be required to create an 'object‑oriented' immersive soundfield capable of reaching genuinely high volume levels. So the fundamental design brief for the S360 reads: compact, flat and wide bandwidth, tightly controlled dispersion, and ability to play loud. It's a brief that has as much 'PA' about it as it does 'monitor'. Genelec are relatively unusual among monitor manufacturers in taking their responsibility to publish believable technical specifications seriously, and a quick scan through the data in the S360 user manual shows there's little doubt that those design brief parameters have been met. The S360's frequency response is flat on axis from 39Hz to 19kHz, within ±2dB limits. Its horizontal dispersion falls in a gentle and linear way with frequency, and in the vertical axis, shows only a narrow discontinuity over the crossover region. And a single S360 can achieve a short‑term sound pressure level of up to 112dB at two metres in a room with a 0.4s reverb time. That's a genuinely high sound pressure level for a relatively small monitor. Without self-spoiling my review, Genelec's success in satisfying their design brief is notable, and the S360's performance is in some respects an advance on the kind of monitoring we're all mostly used to. However, the S360 is still at heart a traditional moving-coil speaker that would look familiar to Rice and Kellogg who first (well, some say that's debatable) came up with the concept in the 1920s. In fact, and somewhat ironically, despite its intended application in genuinely cutting‑edge audio production, the S360 is in some ways more conventional than Genelec's other recent monitor launch, the One series. Having written that the S360 is reasonably conventional in terms of appearance, I'll move on to describing it more fully. In terms of overall dimensions, the S360's 36 x 36 x 53cm isn't all that much bigger than the kind of size that just about fits into 'nearfield' expectations, although it more comfortably fits the 'midfield' bracket. The S360 enclosure is constructed of black or white finished birch ply. The front edges are rounded to reduce diffraction and the horn waveguide of the tweeter is machined directly into the wooden carcass. On each side of the enclosure are tapped bosses intended for the connection of mounting hardware, and the underside of the enclosure is similarly equipped for the attachment of speaker stands. The underside of the enclosure also incorporates a plinth that both positions the down-firing reflex ports an appropriate distance from any mounting surface, and provides some mechanical decoupling. The plinth can be removed when the S360 is stand‑mounted. The S360 is a two-way active system, with the usual arrangement of amplifier and connections around the back. The amplification employs Class‑D technology and is rated at 250 Watts for the bass/mid driver and 100 Watts for the tweeter. Very unusually, and potentially very usefully in some installations, the S360 amplifier module can be removed and rackmounted remotely. 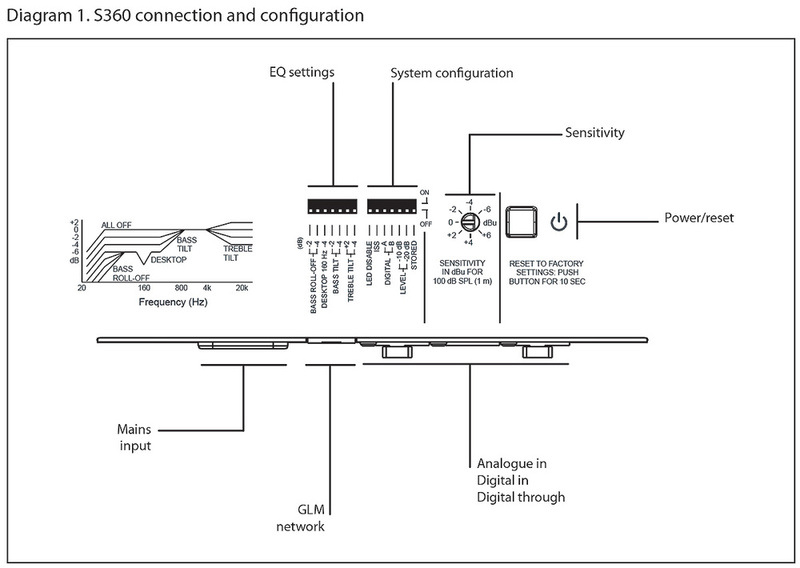 Connection from amplifiers to speaker in the case of remote amplification is achieved through four‑way Speakon connectors. I'll move on to describe the S360's configuration and control facilities more fully a few paragraphs down the page, because I first want to write a little about its drivers. Said drivers are perhaps the most obvious sign that the S360 is not a typical contemporary studio monitor. Firstly, the tweeter is a deep horn‑loaded, titanium‑diaphragm compression driver. Compression drivers are most often found on speakers designed for live‑sound applications, where efficiency, very high volume capability and reliability are priorities — sometimes, it has to be said, at the expense of sound quality. Having 'dissed' compression drivers, however, my experience of the JBL 7 Series monitors, reviewed in the February 2018 issue, showed that these days they can definitely be made to compete on sound‑quality terms with direct‑radiating drivers. The operating principle of a compression driver is not, in reality, hugely different from that of a direct-radiating driver: there's still a voice coil suspended in a magnetic field and attached to a diaphragm. The difference is that the diaphragm radiates into a small volume, connected to a horn (often these days known as a waveguide) by an aperture that's significantly smaller than the diaphragm. The compression that then occurs as the diaphragm radiates significantly improves coupling to the air, and consequently lifts the radiation efficiency. The aperture forward of the diaphragm creates the mouth of the horn, which then also progressively helps match the diaphragm impedance to the air, while at the same time defining the overall directivity. It's not only the S360 tweeter that appears inspired by a PA driver technology. The S360 bass/mid driver also incorporates features more usually seen in speakers designed for live sound. Firstly, its 250mm nominal diameter is large for a unit required to reach significantly up into the mid‑range, and secondly, its coated‑paper diaphragm and pleated roll surround are features traditionally aimed towards maximising sensitivity and level, sometimes at the expense of response linearity and coloration. The use of a PA‑style bass/mid driver in the S360 is the second time recently that I've seen such a thing in a speaker system designed for low coloration and high tonal accuracy, the other example being the Finkteam Borg hi-fi speaker: www.finkteam.com/borg. I wonder if advances in computer modelling of diaphragm behaviour are enabling diaphragm materials and profiles that were previously considered as only good for less demanding PA applications to become viable for high‑accuracy monitoring? Even with an extremely high‑performance 250mm bass/mid driver, however, "You cannae change the laws of physics, Jim," and a fundamental consequence of the driver's size is that it will become noticeably directional at a relatively low frequency. So if the system of bass/mid driver and tweeter is not to have a significant off-axis dip in its frequency response, which wouldn't be a good thing, the crossover frequency between the two needs to be set at a frequency below that at which the dispersion of the bass/mid driver narrows. The crossover frequency on the S360 is therefore down at 1400Hz, which is an octave or more below that of more traditional two-way speakers — and which, with a conventional direct‑radiating tweeter, wouldn't be feasible. A low crossover frequency is well within the realm of the S360's horn‑loaded compression tweeter, however. Another useful consequence of the S360 tweeter's waveguide loading is that its widest dispersion is defined largely by the dimensions of the mouth, and it's no coincidence that said mouth is around the same size as the bass/mid driver diaphragm — which mean that, around the crossover frequency, the dispersion of the tweeter and bass/mid driver will be similar. All the pieces of the jigsaw fit together to give the S360 both the high volume-level capability and the well‑controlled and relatively narrow dispersion it needs to meet its intended applications. I've touched on the techniques employed in the S360 to manage its dispersion and to provide high volume-level capabilities, but written nothing so far about bandwidth. When 'bandwidth' is mentioned in the context of speakers it's almost always in reference to low‑frequency extension, because that's fundamentally defined by some rather noticeable electro-mechanical parameters — things like enclosure size, bass driver diameter and amplifier power. But low‑frequency bandwidth is also partly defined by the bass loading technique chosen for the system: reflex, closed-box, and transmission line being the three most common. For the S360, Genelec have chosen the reflex‑loaded option, with suitably profiled ports exiting on the underside of the enclosure. Bearing in mind the intended applications envisaged for the monitor, and the need to keep it relatively small and affordable, reflex was, I suspect, the only viable option. I've written about the inherent time-domain characteristics of reflex‑loaded speakers many times in these pages, and have argued that, for nearfield mix monitoring duties in particular, the minimal inherent low‑frequency group delay (the frequency‑dependent latency inherent to an analogue filter) offered by closed‑box loading is a significant benefit. To put some numbers on this, closed‑box nearfield monitors typically have group delay of around 5ms below 100Hz. In contrast, the S360's published group delay (Genelec are to be applauded for publishing group delay numbers) is around 10ms at 80Hz, rising to around 23ms at 50Hz. Clearly, given that I'm not in the position of designing monitoring systems that need to work in their intended environment and application, it would be easy for me to write that every monitor should be employ closed‑box loading to minimise group delay, or perhaps incorporate DSP‑based time‑domain correction in order to compensate for it. But a conversation with Genelec's Technical Director, Aki Mäkivirta, about the S360 and reflex loading illustrated perfectly why a closed‑box or even a group‑delay‑compensated S360 wouldn't really work. Firstly, the S360's combination of bandwidth, enclosure size, amplifier power and cost target simply doesn't fall within closed‑box territory. One or more of those parameters would have to be significantly modified, and then the S360 would no longer meet its design brief. And secondly, despite the S360 being very much a digital product that brims with DSP power, equalising in the time domain to compensate for LF group delay would unavoidably increase the wide-band latency of the entire system to somewhere around 30ms, which, in a multi-channel and quite possibly audio-visual monitoring environment, isn't workable. In a genuinely practical sense, the S360 is toe-to-toe with the laws of physics, which, as I mentioned earlier, "you cannae change". One of the things you can change on the S360, however, is its configuration. In common with other Genelec models, the S360 rear panel is well populated with connection and control sockets, and DIP‑switch configuration options. This is illustrated in Diagram 1. Diagram 1: The rear-panel controls and connectors. Signal connection to the S360 is by either balanced analogue XLR or digital AES‑3 XLR. A digital 'thru' output socket is fitted to enable signal daisy-chaining. Alongside the signal inputs is an RJ45 socket for GLM (Genelec Loudspeaker Manager) network connection, and finally, next door to that is an IEC mains input socket. Located just above the sockets are two banks of seven DIP switches. The left‑hand bank offers EQ configuration including 0dB, -2dB and -4dB low‑frequency roll-off options, similar low‑frequency shelf options, a desk‑mount EQ contour, and finally +2dB, 0dB, -2dB and -4dB high‑frequency shelf options. 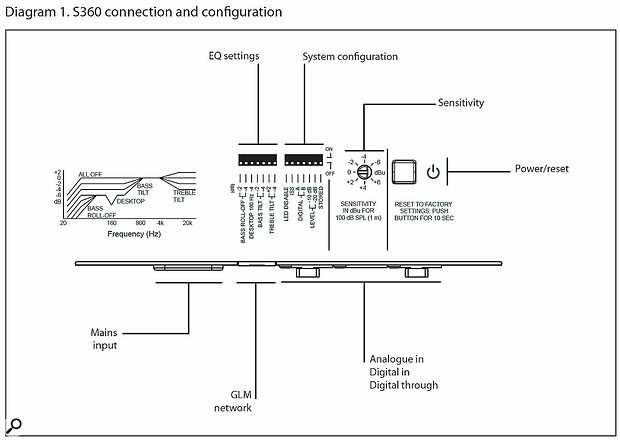 The right‑hand bank of DIP switches offers LED illumination options, automatic power saving, digital channel selection, level (0dB, -10dB, -20dB, -30dB) and finally an option either to select the rear‑panel DIP switch configuration for the monitor or, if it's connected to a GLM network, to load the stored configuration and room-compensation EQ. Alongside the right‑hand DIP switch is a rotary knob offering ±6dB fine control of input sensitivity, and a power/reset button. In light of the 'midfield' size of the S360 and its intended high‑level monitoring duties, my usual practice of listening to review monitors on either side of my DAW in my home studio room was not really appropriate. 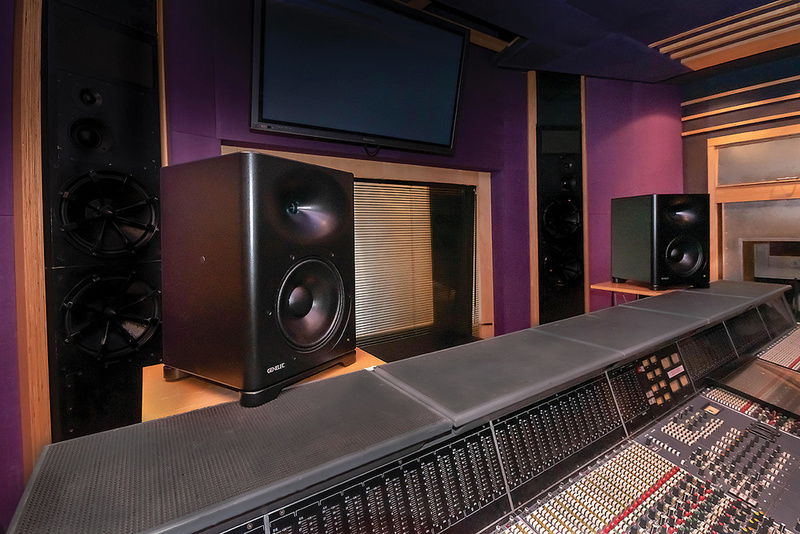 So Genelec kindly gave me the opportunity to hear the S360, along with the Genelec 7382 subwoofer (see box), in the Studio C control room at London's Metropolis Studios. Of course, listening in an unfamiliar environment without access to known monitoring references is not the same as listening in one's own space, especially as my usual practice with review monitors is to combine concentrated listening with continual use for background listening, but I think it's still possible to make value judgements about the sound and to form an opinion on a monitor's success or otherwise. I spent around three hours listening at Metropolis to a range of familiar material from CDs and Pro Tools sessions, sometimes with the S360s alone and sometimes in conjunction with the 7382 subwoofer. In addition to hearing the S360 with and without the subwoofer, I was also able to hear the system with and without Genelec's GLM monitor control and calibration software (see box). My first impressions were of an extremely revealing monitor that holds absolutely nothing back in terms of detail and clarity. With the subwoofer operating, as perhaps is to be expected considering its size, the system's low‑frequency bandwidth was to all practical purposes unlimited — and that's how it sounded. There was an utter lack of any sense of low‑frequency mix elements missing or being curtailed. With the S360 alone, things returned to a more normal listening experience but still with no great lack of low frequencies, and still with that same sense of clarity and ability to offer great insight into the architecture of a mix and the character of each mix element. The S360 is not really intended as a traditional stereo mix monitor, but it undoubtedly has the necessary abilities. Monitors that provide great clarity, like the S360, can sometimes also seem tonally cold and unrelenting, and part of me was expecting to hear that sort of character from the S360 — especially in the context of its paper bass/mid driver diaphragm and compression tweeter. But that turned out not to be the case at all. One favourite piece on CD that I took along to Metropolis, and which perfectly illustrated the S360's tonal character, is an old Nimbus recording of Benjamin Britten's 'Variations on a Theme of Frank Bridge'. It's a fabulous recording of a fascinating piece, but sometimes it can verge towards the uncomfortable in its string tonality. Heard over the S360s, however, the strings were rich and warm, yet still extravagantly detailed, and perhaps even more remarkably, their seductive character didn't waver as the volume rose. Stereo imaging, too, was spectacular and I could have listened to that CD all day. Tonally, the S360 is a remarkably smooth‑sounding monitor with very few, if any, rough edges. With the GLM room compensation switched off, a little of the S360s' smoothness seemed to dull, to reveal a little more speaker‑borne character. The sound became just a little less precise, but still the fundamental quality of the S360 shone through and, again, the volume level didn't seem to matter. It was the same, whether quiet or really quite loud. With or without GLM room compensation, the smoothness of the S360 continues up into the high frequencies where there appears absolutely no sign that the tweeter is a compression driver. The tweeter is smooth and detailed, and down at the other end of the band, with the 7382 subwoofer muted, the S360 seemed relatively dry in its bass character, with no obvious tell-tale reflex port effects — although of course it's at low frequencies that an unfamiliar room acoustic is at its most, well, unfamiliar. However, another favourite CD I took out for the day was Joe Jackson's Body And Soul, and the S360s did every possible justice to its spectacularly rich and resonant bass. Body And Soul is an early digital multitrack recording from the mid-1980s. It's a predominantly live recording with a seriously great band set up in an old Masonic hall in New York that turned out to have, I think, one of the finest acoustics for rock & roll that has ever been recorded. As with the Benjamin Britten CD, Body And Soul played right into the strengths of the S360: dynamics, volume, detail, clarity and a fabulous portrayal of that amazing recorded acoustic. Using the S360 in a traditional stereo monitoring role is of course not really the application that they were primarily developed for. On the basis of the few hours I spent with them in that mode, however, there's little doubt in my mind that they could take almost any role in their hugely long stride. The S360 is very much a hit. For slightly differing reasons, the S360 and 7382 subwoofer stand somewhat out on their own: the subwoofer because pretty much nobody else makes a sub quite so ambitious, and the S360 because it's really aimed at a new niche. However, if you were to consider the S360 in a nearfield/midfield monitoring role (in which I think it would excel), three similarly ambitious monitors you'd also probably want to hear are the Kii Three, the Neumann KH420 and the Unity Audio Boulder. The 7382 subwoofer uses three 15‑inch drivers and is driven by an external 2.5kW amp.The 7382 is Genelec's largest and most powerful subwoofer. It employs three 380mm (15‑inch) drivers, driven by an external amplifier rated at 2.5kW, in a reflex‑loaded enclosure of around 400 litres internal volume. The -6dB low‑frequency cutoff is at 15Hz and the system can achieve 129dB SPL at 1m between 30Hz and 85Hz. The 7382's group delay exceeds 50ms at 20Hz; however, where I think it matters most (in the kick drum/bass guitar band above, say 40Hz), it's well below 10ms. The 7382 weighs a trifling 145kg. All Genelec's SAM (Smart Active Monitor) products, including the S360, are able to benefit from optimisation and system configuration provided by the GLM (Genelec Loudspeaker Manager) application. There are two elements to GLM. First there's the 'management' side of things, probably most useful on larger multi‑channel installations where monitoring configurations for different user preferences or listening positions need to be setup, stored and quickly recalled. GLM can manage systems of up to 45 individual SAM monitors and subwoofers. The second element of GLM is room compensation, which, in conjunction with a custom measurement mic and USB interface, uses response measurements taken at a range of positions to calculate room-correction coefficients for each monitor in the system. GLM then sends the coefficients to each monitor as appropriate, where the monitor's internal DSP engine translates the coefficients into EQ curves for each driver. GLM, like the similarly conceived Sonarworks, IK Multimedia ARC and Trinnov systems has, to my mind, its pros and cons. The top-line pro is that, at the listening position, the subjective frequency response can be made more linear (or made to hit a specific response profile). The con is that the monitor frequency response away from the optimised listening position can become bent noticeably out of shape, especially if the room is acoustically poor to begin with. There are also potential issues of monitor overload, especially at or below the port tuning frequency, where a room EQ curve may demand levels from a monitor that it is simply unable to deliver. Seductive combination of volume, bandwidth, clarity and tonal accuracy. The S360 seems something genuinely different from Genelec. Its design was driven by a contemporary demand for compact, multi-channel immersive monitoring, but the result is a brilliantly capable monitor that would be able to succeed in almost any monitoring role. 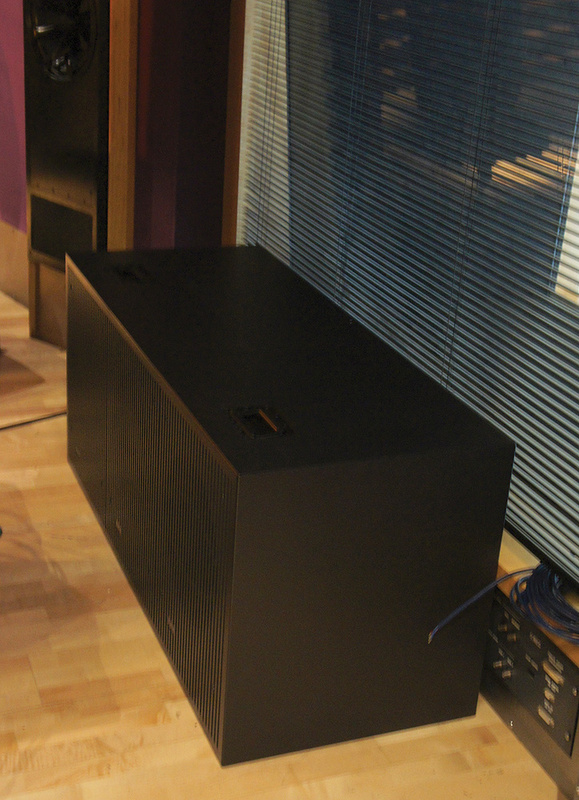 S360 £6998 per pair, 7382 subwoofer £9099. Prices include VAT. S360 $9190 per pair, 7382 subwoofer $11,995.